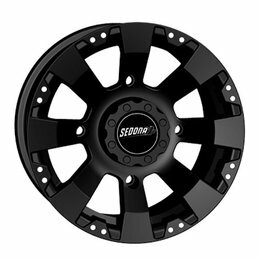 Manufactured from aluminum with polished black accents Ultra strong and lightweight Includes cap Style: Spyder Location: Front or rear for all models listed Size: 14x7 Bolt pattern: 4/115 Offset: 5+2 Fits the following Arctic Cat models: 1000 2002-2011 300i 2002-2011 400i 2002-2011 500i 2002-2011 650i 2002-2011 700i 2002-2011 Please Note: The image displayed is representative of the item, but may vary depending on your specific model. 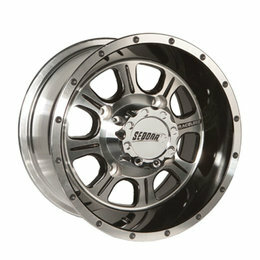 Manufactured from aluminum with polished black accents Ultra strong and lightweight Includes cap Style: Spyder Location: Front or rear Size: 12x7 Bolt pattern: 4/137 Offset: 5+2 Fits the following Kawasaki models: TERYX 2008-2011 MULE 2500 SERIES (all years) MULE 3000 SERIES (all years) MULE 4000 SERIES (all years) Please Note: The image displayed is representative of the item, but may vary depending on your specific model. Manufactured from aluminum with polished black accents Ultra strong and lightweight Includes cap Style: Spyder Location: Front or rear for all models listed Size: 12x7 Bolt pattern: 4/115 Offset: 5+2 Fits the following Arctic Cat models: 1000 2002-2011 300i 2002-2011 400i 2002-2011 500i 2002-2011 650i 2002-2011 700i 2002-2011 Please Note: The image displayed is representative of the item, but may vary depending on your specific model. 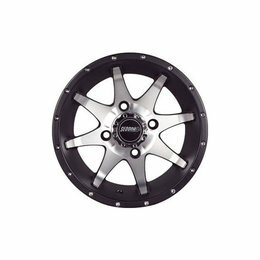 Manufactured from aluminum with polished black accents Ultra strong and lightweight Includes cap Style: Monster Location: Rear Size: 12x7 Bolt pattern: 4/137 Offset: 2+5 Fits the following Kawasaki models: BRUTE FORCE 650 4x4 (STRAIGHT AXLE) 2006-2010 MULE 500 (all years) MULE 600 (all years) MULE 610 (all years) PRAIRIE 360 2002-2007 PRAIRIE 400 1997-2006 PRAIRIE 650 2002-2006 PRAIRIE 700 2002-2006 Please Note: The image displayed is representative of the item, but may vary depending on your specific model. 4mm thick aluminum rolled outer edge polished finish Location: Rear Size: 9x8 Bolt pattern: 4/115 Offset: 3+5 Fits the following Yamaha models: BANSHEE 1991-2007 RAPTOR 250R 2008-2010 RAPTOR 350 2005-2010 RAPTOR 660R 2001-2005 RAPTOR 700R 2006-2010 WARRIOR 350 1987-2004 YFZ450 2004-2010 YFZ450R 2004-2010 Please Note: The image displayed is representative of the item, but may vary depending on your specific model. 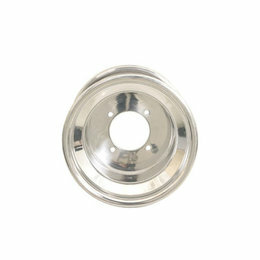 4mm thick aluminum rolled outer edge polished finish Location: Rear Size: 10x8 Bolt pattern: 4/115 Offset: 3+5 Fits the following Yamaha models: BANSHEE 1991-2007 RAPTOR 250R 2008-2010 RAPTOR 350 2005-2010 RAPTOR 660R 2001-2005 RAPTOR 700R 2006-2010 WARRIOR 350 1987-2004 YFZ450 2004-2010 YFZ450R 2004-2010 Please Note: The image displayed is representative of the item, but may vary depending on your specific model.